Verizon 2011 Q1 earning report reveals 2.2 million iPhone 4 sold, outselling most popular Android 4G phone on Verizon. Verizon 2011 Q1 financial report: Earnings up 5.3% over same quarter last year (YOY). Sold 2.2 million Verizon iPhone 4. What the numbers mean: Apple iPhone crushes Android phone sales. Verizon iPhone 4 launched on February 10, 2011. The quarter ended in March 31, 2011. That’s 7 weeks. 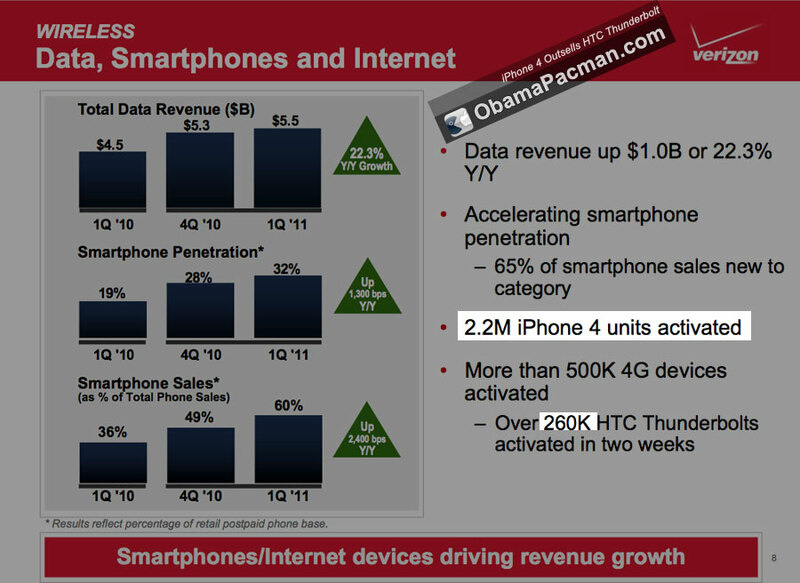 ObamaPacman.com reports: divide 2.2 million by weeks = 314,000 Verizon iPhone 4 sold per week. HTC Thunderbolt, an Android phone, sold 260,000 in 2 weeks. For the Fandroids who fail at basic math: that’s 130,000 per week. All other Verizon 4g phones (almost all Android) sold total of 240,000 handsets, in 3 months. That’s how many per week? Previously, Verizon announced that iPhone 4 sales sets record and beats Android in 2 hours, so this news is not a surprise. Apple announced in the 2011 Apple Q2 earnings report that the Cupertino company sold 18.65 million iPhone during the quarter world wide (with 3.6 million activated by AT&T). 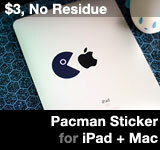 This entry was posted on Friday, April 22nd, 2011 at 11:08 am	and is filed under iPhone. You can follow any responses to this entry through the RSS 2.0 feed.